Anytime you name a character “Screwface” – even if it is after a Bob Marley song – and you’re not discussing a possible new villain for the DC or Marvel Comic Universe, your movie is already in trouble. Steven Seagal verses Screwface? Does Screwface shoot screws out of his face? Does he fly? No, he’s not a villainous superpower but he is a bit on the mystical side as the terrifying drug kingpin in Seagal’s old Chicago stomping ground. 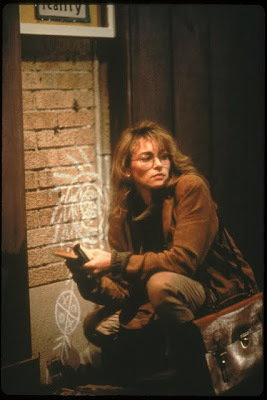 Leaving his post at the DEA after his partner Chico was killed during his last assignment, at the beginning of Dwight H. Little’s Marked for Death the last thing that John Hatcher (Seagal) wants to do is spend any more time being a cop or cleaning up the neighborhood, no matter how much crack has been sold to teens. Rationalizing to his old friend, the local high school football coach Max (Keith David) that drugs are an endless cycle and he doesn’t “think the world wants to change anyway,” John instead prefers to follow his world-weary adage of watching his “own yard and if trouble finds you, you go bite its head off.” And sure enough, deadly trouble hits his yard in the form of a drive-by shooting that leaves his niece in the hospital ICU fighting for her life. After crossing the wrong path—and of course here we do mean Screwface (Basil Wallace) – it’s open season on John Hatcher and his entire family as they’re marked for certain death whether it’s from gunfire, voodoo black magic, martial arts, sword play or a particularly deadly encounter at a shopping mall. 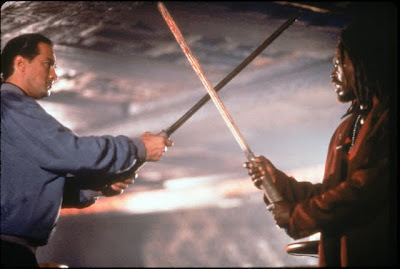 Putting the screws to Screwface’s posse of lawyers and petty thugs, John and Max soon team up with a Jamaican police officer (Tom Wright as the only good Jamaican in an otherwise pretty stereotypically racist movie) and vow to fight back even harder in biting the head off of trouble before it does the same to everyone he cares about. 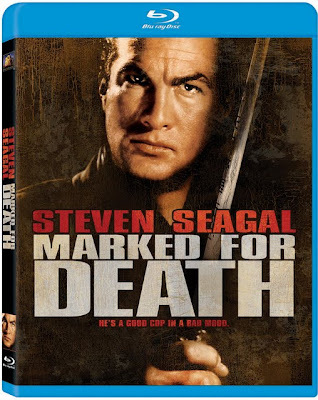 While Marked by its age as the flaws of the twenty year old film show up easily in this murkily colored Blu-ray, the sound of Fox’s high definition more than meet the picture halfway as you’ll hear every single bullet hit the floor in your home theatre set-up. Unfortunately, outstanding sonic level aside, the film itself is an ultimate letdown as – aside from the stupidly gratuitous violence that doesn’t fit certain situations-- there’s so many gaps in logic that we must check our brain at the door completely. 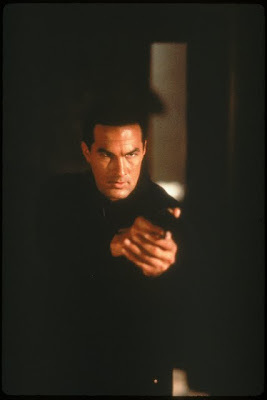 Although I’m not sure if security cameras were in common use at the mall in 1990, you’ll laugh at how invincible to the law Seagal is as he walks around dressed in black shooting people left and right. 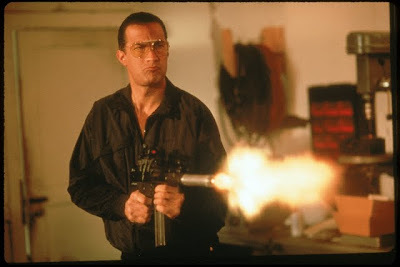 Thus, by the time Seagal and company travels to Jamaica where of course he’ll stick out, suddenly we realize that thanks partly to Screwface and the over-the-top Rastafarian stereotypes, Marked for Death has become unintentionally funny instead of delivering the action thrills we craved in what at least began as a believable cop flick.